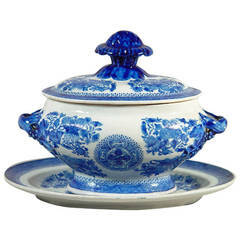 This large-size Chinese Export porcelain serving set (tureen, cover, underliner) was made for the American market in the Federal Period during the reign of the Jiaqing Emperor, circa 1796-1810. The decoration is simple and refined and symbolic. 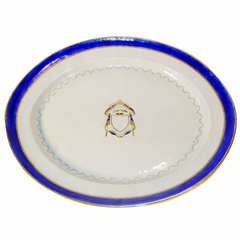 The set is edged with a cobalt blue band between two gold stripes, with a running swag pattern just inside it. The handles are twisted branches. The knop is a cabbage. The heart-shaped shield is sheltered by an ermine-lined blue silk robe with cloth-of-gold tassels, trimmings, and ribbons. Above the shield are two turtle doves facing each other. They are standing on a gold and black silk bolster pillow. Turtle doves, or love birds, mate for life and here they represent a wish for a happy marriage. 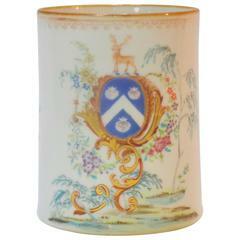 Ermine symbolizes purity and honor, silk strength, blue loyalty and gold wealth and status. The armorial shield usually contains, in gold script, entwined initials of the couple getting married. But these shields are blank. This set was store stock that was never sold, so initials were never added. The set remains available for anyone's initials if you want to personalize it. Or, it is just as noteworthy and symbolic as it is. 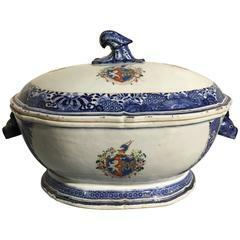 The large size, the fine antique condition, the turtle doves, and the lack of initials are all characteristics which make this tureen set rare and desirable. 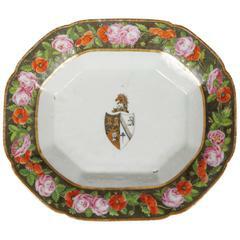 And it is useful -- for a centerpiece, as a cabinet decoration or on a sideboard. 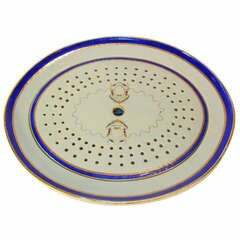 The set can also be used for the original purpose -- to serve soup or stew, or at a breakfast buffet to serve special eggs, or even as a decoration to hold potpourri. It is the perfect wedding present. 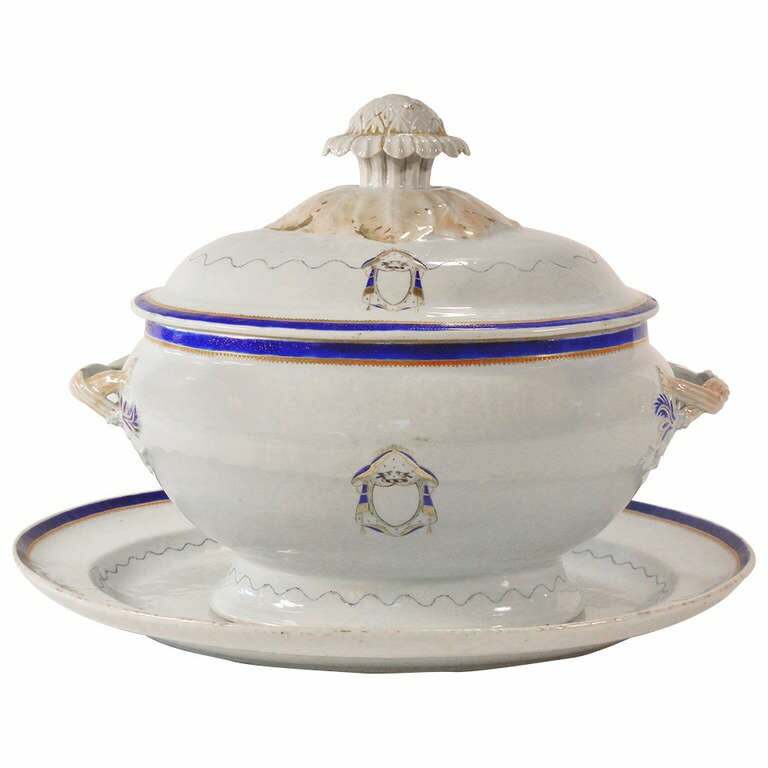 Measurements of the underliner: 16" L x 13.25" D x 1.5" H. The tureen measurements are listed above. Slight wear of cobalt color on rim but nothing major. More wear of the gold highlights of the knop and the underliner's shield. Imari Fukagawa "Black Ship" tureen, commemorating the Dutch traders and their sailing vessels.